Although these beautiful beasts have stalked the thick undergrowth of the jungle and the heart of South and Central America for centuries, it may surprise you to know that they are originally from Asia. Scientists have traced the path of the Jaguar from its home, across the Bering Strait, and through North America. It followed big game animals down to Central and South America where the species now lives, undisturbed in the biological maze of the jungle. Jaguars are most closely related to leopards, tiger, and snow leopards. Their spotted coloration is actually due to a dominant gene and it isn't unusual for jaguars to be born sans spots. Jaguars without spots are commonly known as black panthers. The Jaguar was, and still is, a revered Spirit of the Forest. They remain in the confines of the shadows, opting only to reveal themselves on the hunt at the moment when the prey has been snared in their ambush. The Jaguar's killer instincts, fiercely protective attitude, and its powerful, unseen presence in the forest were held in high regard by several civilizations during the Mesoamerican era and even to this day, the animal is seen as the ultimate example of how Elegance, Beauty, Bravery, and an untamable spirit can all be rolled into one majestic animal. The Mayas, The Incas, and The Aztecs all paid homage to the Jaguar. Ornate temples were built in honor of the animal totem and offerings were made to the Jaguar in an attempt to appease the spirits and protect the village. It was commonplace to decorate walls, buildings, pots, ceramics, and even pieces of jewelry with the Jaguar motif. These animals were often seen as gods of the Underworld with responsibility for the realm of the Dead. The belief was that if the Jaguar's spirit wasn't happy, then the family's ancestors would also be in misery in the Afterlife. Miserable ancestors resulted in failed fortunes for the family because many Mesoamerican cultures believed that the Underworld was the place from whence plants originated. If the spirits weren't appeased, then the year's harvest was sure to fail. As such, the Jaguar became associated with Fertility and Prosperity. The Aztecs also believed that these beautiful animals were the physical representatives of the all-powerful deity, Tezcatlipoca. For the Mayans, the animal was an important symbol of Power, Status, and Divinity. Many of the culture's important religious festivities were in some way connected to the totem. Mayan kings had to undergo an elaborate ritual that centered on the animal during their coronation ceremony and only elite members of the royal court were allowed to hunt and wear jaguar pelts. Even the king's throne room was decorated to honor the Jaguar gods and after the official coronation ceremony, every Mayan ruler changed his name to incorporate the word "Jaguar" as a symbol of his power and divine right to rule. By far, the animal's most notable role is its bravery and fighting spirit. It was such an important emblem for warriors, that even to this day, men still adorn themselves with images of the Jaguar as a way of bringing the spirit of the animal into their bodies. The Aztecs had a regimen of elite soldiers known as the Jaguar Knights, who were the Mesoamerican equivalent of today's elite Navy Seals and the Knights Templar rolled into one package. They were fast, vicious, and highly trained. Getting into the ranks of a Jaguar Knights was a task that only the Crème' de la Crème' of the military caste could accomplish. The Jaguar's reputation for power, strength, beauty, and elegance was not lost on innovative business men in the modern world. The high end car brand, Jaguar, has set a standard in redefining what elegance and luxury mean to the modern car enthusiast. Founders William Lyons and William Walmsley created designs that were sleek, stylish, and sophisticated, making the company's cars unlike any other. Not bad for a big cat from the jungle! Although Jaguar Tattoos come in all forms, it is extremely rare to see them in all colors. The intrinsic beauty of a jaguar lies in its spots, so many artists will create designs that highlight the beauty and intricate detail of the animal's perfect coloration. 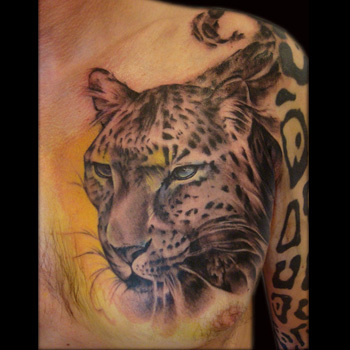 A tribal tattoo of a jaguar can be interpreted as being that of a leopard or a cheetah, which explains why artists avoid taking this design route. 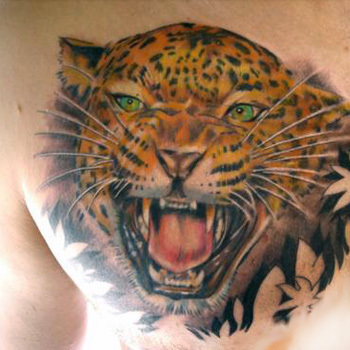 Another thing to note is that many persons get Jaguar Tattoos on top of major muscle groups in the body. By doing so, you can give the illusion that your body art is moving and has a mind of its own, all of which help to add to the air of intrigue and makes your artwork stand out from the masses. Jaguar Tattoos are most often worn by men because they readily identify with the power and quiet, reserved strength that this animal has. This is also a link with long held traditions because in Mesoamerican or Pre-Columbian America, only male warriors sported clothing, objects, and even tattoos that were meant to bring the animal's fierce fighting spirit into their bodies. Jaguar Tattoos are great for showing to the world that you are a powerful person. Having this design is also a way to show your strong spiritual connection with this animal totem and with the indigenous cultures of Central and South America. The elements that you may choose to add to your tattoo speak volumes about your personality, so don't be shy about investing enough time to create a great design. If your imagination tank is coming up on "Empty", then visit us at www.itattoodesigns.com and take advantage of our Custom Tattoo Design Service. Our team would be more than happy to help you create a truly unique piece.